Chinese company is back for another crack but is the B2 a notable sequel? 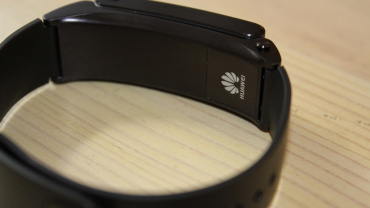 The Huawei TalkBand B1 is a terrible device. We gave it the lowest review score we've ever given anything on Wareable and we described it as "a fitness tracker that is not accurate or feature-rich enough to work very well as a fitness tracker, and a Bluetooth headset that is too fiddly to work very well as a Bluetooth headset". Ouch indeed. 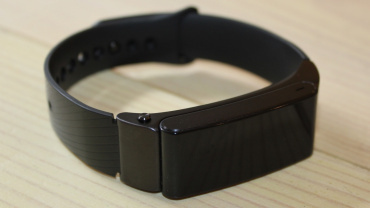 So you can forgive our trepidation as we set about taking the sequel TalkBand B2 ($179) to task. The TalkBand B2 is a wearable that, like its predecessor, offers both fitness tracking and Bluetooth headset functionality. Yep, that's right – just like the original, the TalkBand B2 is a hybrid device – you can pop the module out of the strap and plug it in your ear, if you're that way inclined, turning it from a wrist-based tracker to a hands free headset in seconds. In practice, it's a little bit trickier than the theory suggests. When an incoming call arrives you press the quick release buttons at the bottom of the clasp and then whack it in your lughole. Yes, it fits okay and yes, call quality is pretty decent too – thanks to the Bluetooth 4.1 tech and the dual-mic noise cancelling setup – but it's not the most suave operation. We felt ridiculous doing it in public. And the fitness tracking options won't work properly if you leave it in your ear, so for full-time headset fans, that's not really an option. The TalkBand B2 isn't a smartwatch in any sense; there are no detailed notifications – updates are incoming calls only, which is a bit naff. The B1 was an ugly slab of rubber and plastic, but Huawei has definitely improved the design for the B2. It's just so purty. Actually, to be clear – two out of the three designs are purty; the black one just looks like a regular, chunk of plastic and rubber. But the silver and gold versions – both of which come with a leather strap – are gorgeous. At least the display is. 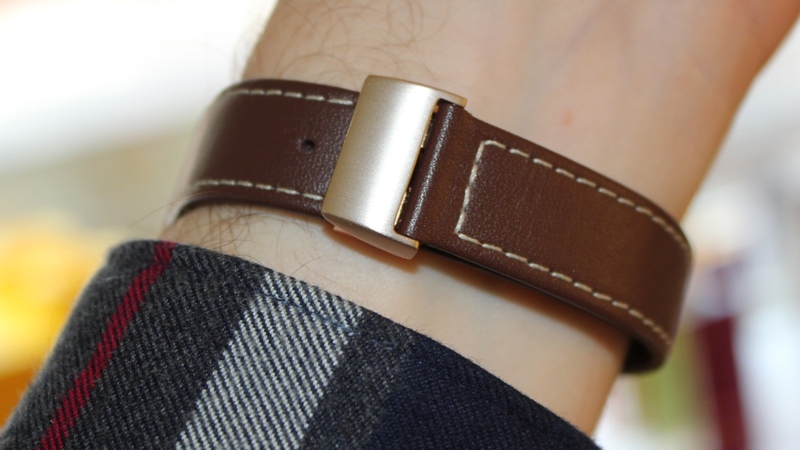 We reviewed the gold one with a brown leather strap. It's a fair bit thicker and heavier than the B1, at 12mm and 33g, although we wouldn't go as far as to describe it as chunky. It is very prominent though – one member of team Wareable quite rightly pointed out that the gold version is quite reminiscent of the 'Rooney' bracelet from Only Fools and Horses. 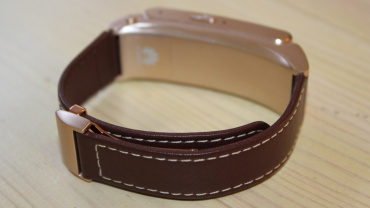 It sticks out a lot more than a regular fitness tracker, such as the Jawbone UP3 or the Fitbit Charge HR, and is a lot more noticeable but it's comfortable and the strap and clasp provided a reliable and solid fit. The display a 0.73-inch, 128 x 88, PMOLED touchscreen number that takes on the colour of the design – so silver, gold or black. Obviously black looks fairly standard but for the more premium metallic designs, the result is pretty stunning. 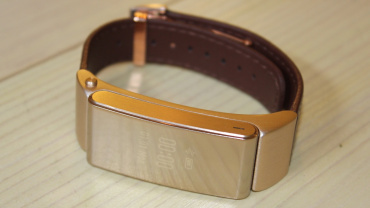 Huawei has certainly added a bit of bling to its wearable range. In bright sunlight it's not the easiest display to see and in dark rooms the 'invisible' effect of the display is somewhat lost as you can make out the edges but we're not marking down for that – Huawei has done a great job with integrating a digital display into what is essentially a piece of smart jewellery. The touchscreen is responsive and that the icons and characters are nice and clear, you simply swipe up to see the different screens on offer: the time, step count, calorie burn, sleep time and activity start. One thing we did notice, a lot, was the auto lighting up of the screen to show the time didn't really work. Rather than a natural wrist movement firing up the display, we found a quite violent flick of the wrist towards our face was needed. When it comes to activity tracking you're looking the familiar mix of step, distance, calories and sleep counting. Fitness tracking is, we're pleased to report, better than on the B1. Much better, in fact. 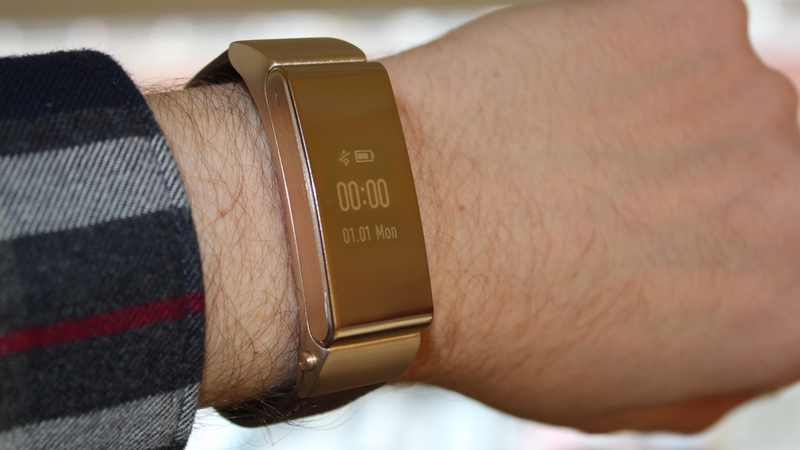 We found the B1 only recorded around 60% of the steps that a Fitbit Flex did. 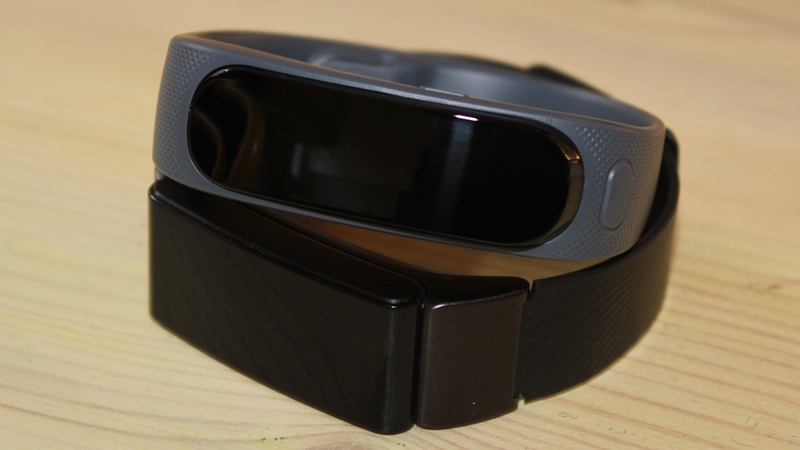 The TalkBand B2, in comparison, is a touch over generous – recording around 10-15% more steps than what a Jawbone UP3 and a Garmin Vivofit 2 picked up. The B2's makers claim it can automatically detect certain activities, such as running, walking and cycling, although it failed to pick up a single run for us – perhaps this feature isn't live yet. Sleep detection is automatic too, but woefully inaccurate. It repeatedly added an extra hour to our average 7-8 hours per night. While we have our doubts with all lifestyle trackers that the REM, light and deep sleep counts are accurate, you'd expect the length of sleep time to at least be there or there abouts. The B2 reminds you to stay active by buzzing and playing an animation when you've not moved for a bit; a useful feature – albeit not one unique to Huawei's wearable. The Huawei Health Platform app (iOS and Android) lets you see all of your tracked stats and, thanks to Huawei and Jawbone teaming up, you can also sync all the data to the latter's popular UP platform. Sharing data with MyFitnessPal is also an option. 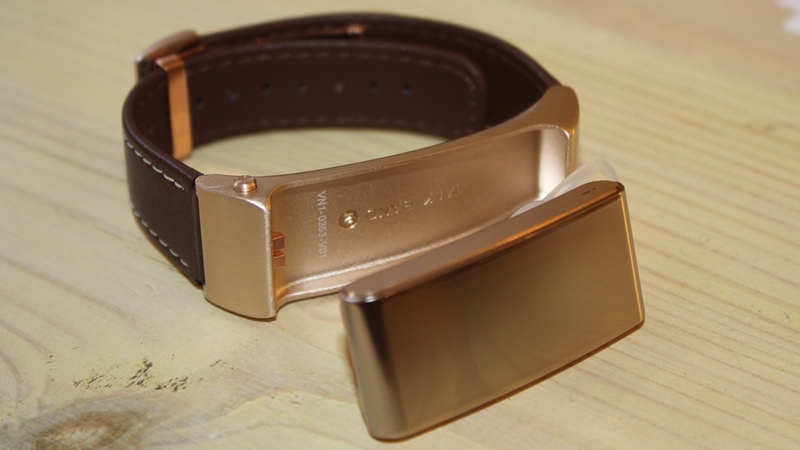 The more accurate fitness tracking is a result of the 6-axis sensor that packs both an accelerometer and a gyroscope. The Micro USB charging aspect is great, as no extra charging accessory is needed; a nice touch in a wearable world dominated by proprietary charging accessories. Huawei is promising a battery life of 5 days from the 95mAh power pack and we can't disagree with that. It's a life source capable of seven hours of talk time as well, although our embarrassment meant we never did one hour of talking, let alone seven. Charging is very quick indeed; you can get over 50% in about 20 minutes, a full tank in just over an hour. The TalkBand B2 is both dust and water-resistant: IP57 for the black-one (1m of submersion), IP55 (light spray) for the metallic ones. The Huawei TalkBand B2 is indeed an improvement on the disaster that was the B1 but, let’s face it, that’s not saying much. 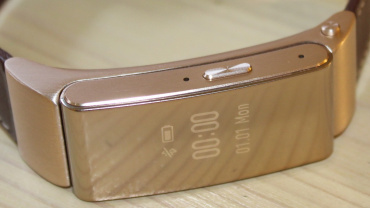 The main issues that plagued the B1 are still evident for the, albeit much better looking, successor – in that it’s not accurate or feature-rich enough to work very well as a lifestyle tracker (although there are improvements on the step counting side), and it’s a too fiddly to work very well as a Bluetooth headset. So, while you might turn heads wearing the TalkBand B2, you probably won’t actually get much useful engagement with it. For a price tag of around $180, you’re not really getting all that much bang for your buck. 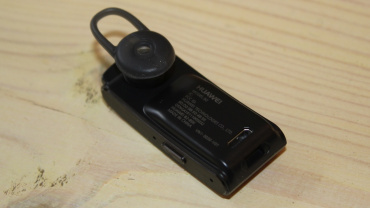 So, while we applaud Huawei on a better effort this time around, it’s still not that great.